Make Your Own "Evil Chinese Professor!" Since we recently announced Volume 2 would be dedicated to shattering Asian stereotypes, it only makes sense to point you all to a brand new Asian stereotype just in time for the midterm elections, thanks to the right-wing “think” tank Citizens Against Government Waste: the Evil Chinese Professor! Well, now it’s our turn to reclaim Professor Evil. A few Asian Am blogs–Angry Asian Man, 8Asians, Disgrasian, Reappropriate, channelAPA, and Hyphen–have gotten together to sponsor this contest. 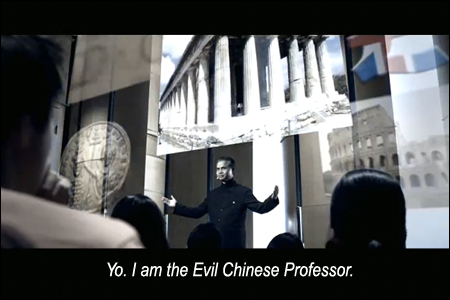 Download the .ZIP archive, including the subtitle-stripped .MOV file and .RTF text file transcript of the original “Chinese Professor” video. Then send the link to evilchineseprofessor@angryasianman.com. The best three videos as judged by the sponsoring bloggers will win some fabulous as-yet-undetermined prizes. The deadline to submit is November 27, which happens to be Bruce Lee’s birthday. Make your own Evil Chinese Professor parody at meemsy.com. Just head over to http://meemsy.com/videos/edit/136 and type your subtitles in – it’s really easy! Previous PostPrevious ANNOUNCING SECRET IDENTITIES VOLUME 2: SHATTERED! Next PostNext Doughboy Needs Your Help!